Prior high precision motorized ZDeck Quick Adjust Platform System complete with Prior ZDeck, motorized ProScan XY stage, ProScan III controller, PS3J100 joystick with dual digipot controls, universal holder, solid aluminium plate, two micromanipulator mounts, condenser spacer and four 10mm pillar spacers. Prior Scientific’s patent pending ZDeck Quick Adjust Platform enables users to increase their productivity by allowing them to image multiple areas of interest with speed and precision. Increased productivity – image multiple areas of interest with speed and precision. ZDeck lowers quickly and easily, providing easy access for loading and unloading samples. No tools are required to adjust the height. Changing between thin sample and whole animal imaging height can be accomplished in seconds. Pneumatic pistons in the ZDeck towers make raising and lowering the ZDeck virtually effortless. Precision or customized ProScan stage provides sub-micron repeatability and smooth movement. Compatible with 6mm or ¼-20 vibration isolation tables. ProScan III controller and PS3J100 joystick provide ultra fine XY stage control via dual digipots. 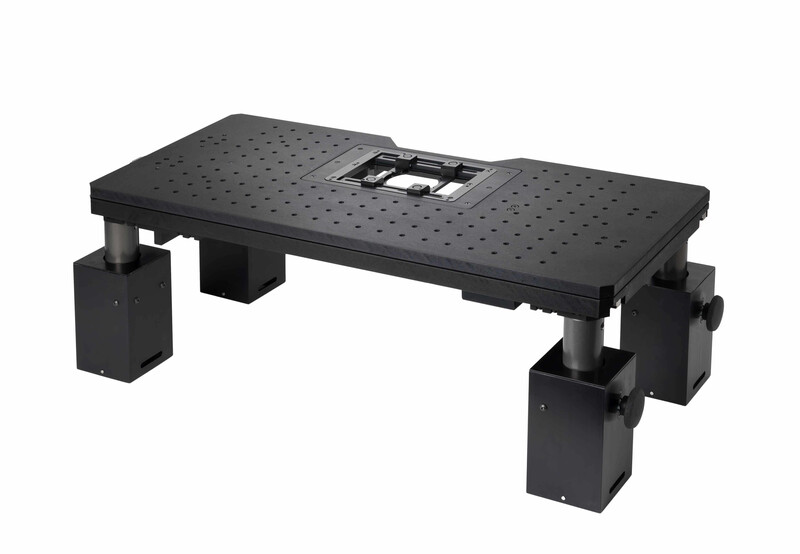 Micromanipulator mounts – oversize ¼-20 plates on both sides. Compatible with the BX51WI and BX61WI forward detector module. Condenser spacer and pillar spacers provided to allow for Koehler illumination at a wide range of focus heights. Optional encoded XY stage for highest precision available.